Ontario is a province of diverse landscapes. If you are willing to put in the necessary travel time you can explore the eroded ranges of the La Cloche Mountains in Killarney Provincial Park, the extensive network of lakes that makes up the interior of Algonquin Provincial Park, or you could even hire a bush pilot to show you what the true north is all about with an aerial tour of Polar Bear Provincial Park along the shores of Hudson’s Bay. But, to my mind, there is one place that stands out above the rest: Georgian Bay. 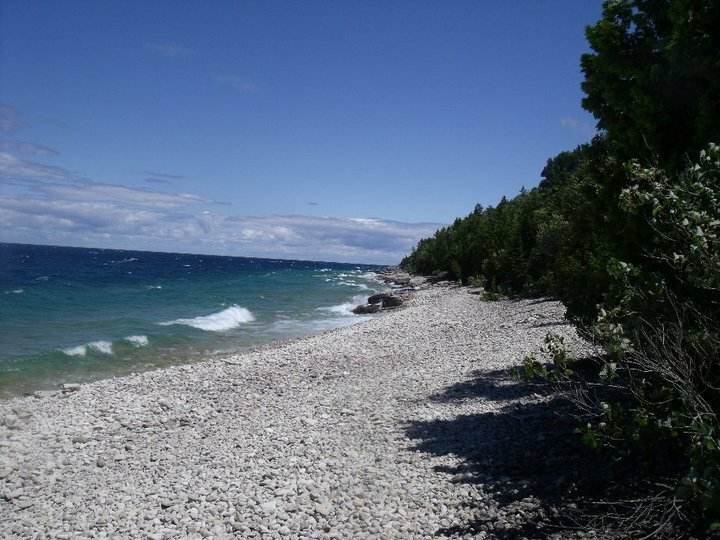 The eastern arm of Lake Huron offers some of the best exploring possible in this vast province, and there are few places where you can get a better sense of that than Bruce Peninsula National Park. 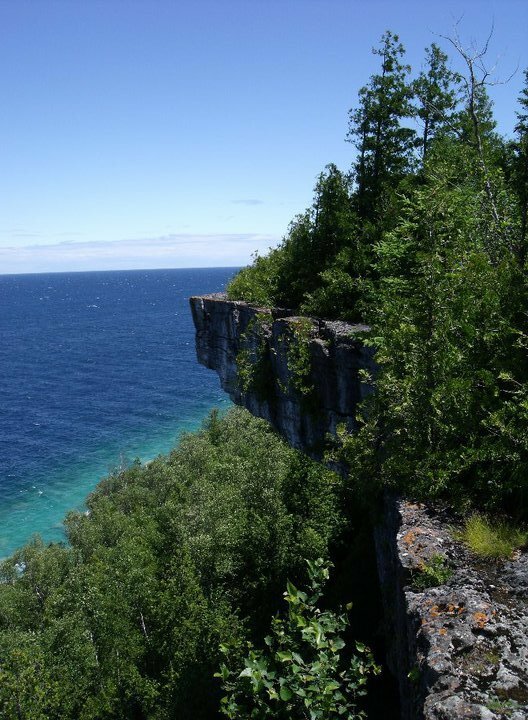 The backcountry hiking trail that winds its way along the northern tip of the Bruce Peninsula marks the last 3 days of the more than 800 km long Bruce Trail that traces its way along the Niagara Escarpment from Niagara Falls in the south to Tobermory in the north. 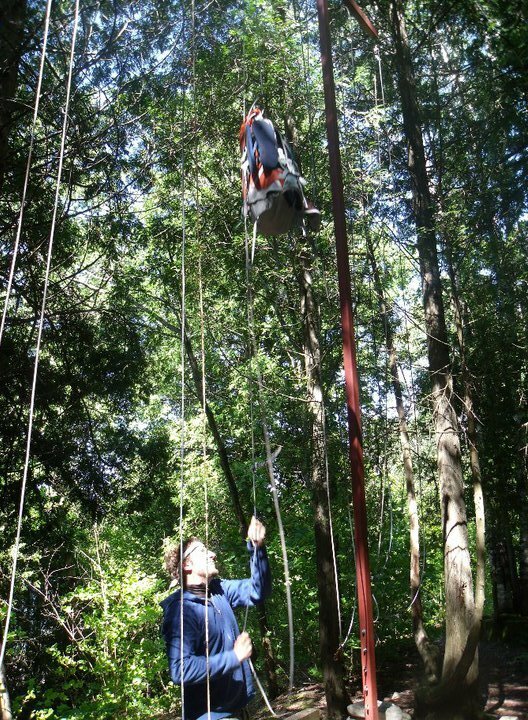 While the entire escarpment is worth exploring, those last three days belong on the life-list of anyone in Ontario who considers themselves a hiker. I made the trip back in 2010 with my then girlfriend (now-wife) Marianne, and my good friend and longtime hiking companion Geoff. Being a straight-line hike rather than a loop, the transportation logistics of the trip are slightly complicated. The ideal situation for hiking through Bruce Peninsula National Park is to have 2 cars available. One to bring you to the trailhead at the Crane Lake parking lot, the other waiting for you at the end, either at Cypress Lake or at the Visitor’s Centre in Tobermory. If you find yourself as we did, with only one car available, the best option is to contact Thorncrest Outfitters in Tobermory who offer a paid shuttle service to hikers. With the aid of the shuttle we were able to drop our car off in Tobermory and begin our hike at Crane Lake. 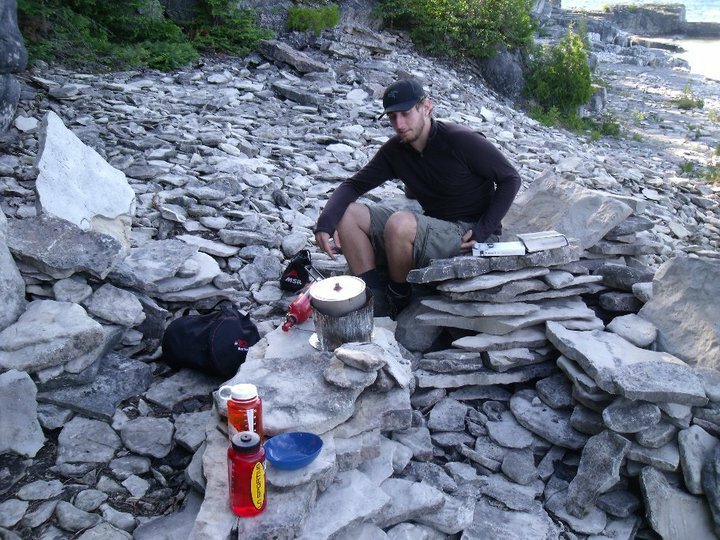 For those familiar with backpacking, the hike from Crane Lake to Tobermory is something of a vacation. While the trail itself is beautiful and the scenery world-class (the park is a UNESCO World Heritage Site) the distances involved are relatively tame. 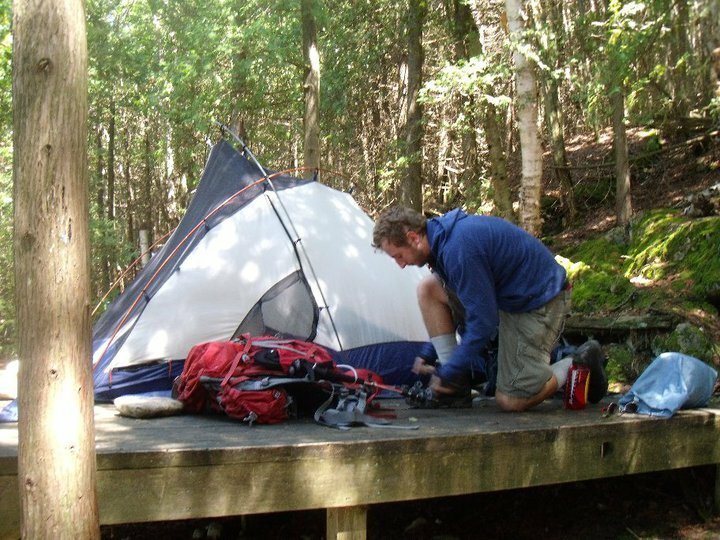 The only reason the hike should take 3 days is to allow you to make use of the well serviced backcountry campgrounds at High Dump and Stormhaven. The 8km trek from Crane Lake to High Dump took us a little under 3 hours with frequent stops along the way to watch frogs, snakes, and birds. The only technically demanding stretch of the day is the final descent to the beach at High Dump, even this section is made easier with the aid of fixed ropes winding their way down the slope through the trees. Your reward for a thoroughly enjoyable hike is crystal clear water, cobblestone beach, and crashing waves (to say nothing other the amenities). I have camped in many places. I have stayed at National Parks all over North America and seen everything from unserviced campgrounds hardly worthy of the name to veritable backcountry luxury. The latter exists to an almost unique degree at Bruce Peninsula National Park. 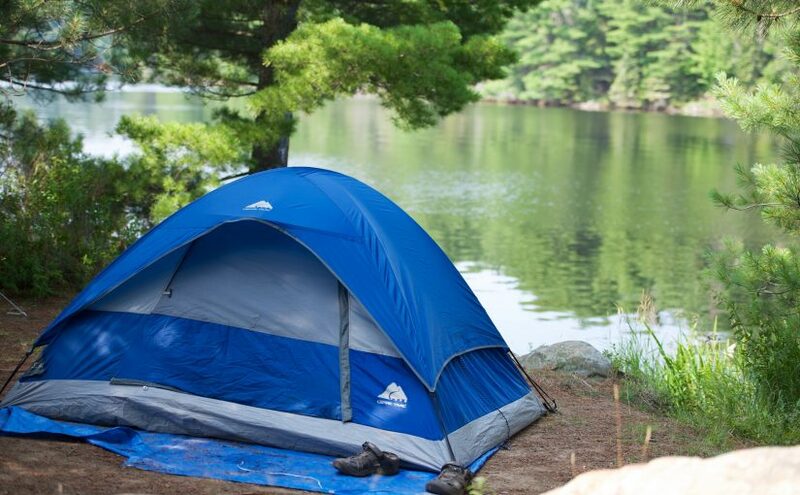 Parks Canada has created campgrounds for backpackers than can only be described as outstanding. Elevated tent platforms overlook the beach so you can fall asleep to crashing waves only a few feet away. Pully-assisted bear hangs keep your food out of reach of animals with minimal effort required on the part of the hiker. Even the outhouses are equipped with composting toilets and solar panels so you can see what you are doing as you brush your teeth after dark. A short day of hiking freed us up to lounge on the beach. We read, played cards, and enjoyed the peace and quiet until it was time for bed. Day Two of the trek to Tobermory presents more challenging terrain than the short Crane Lake to High Dump section. 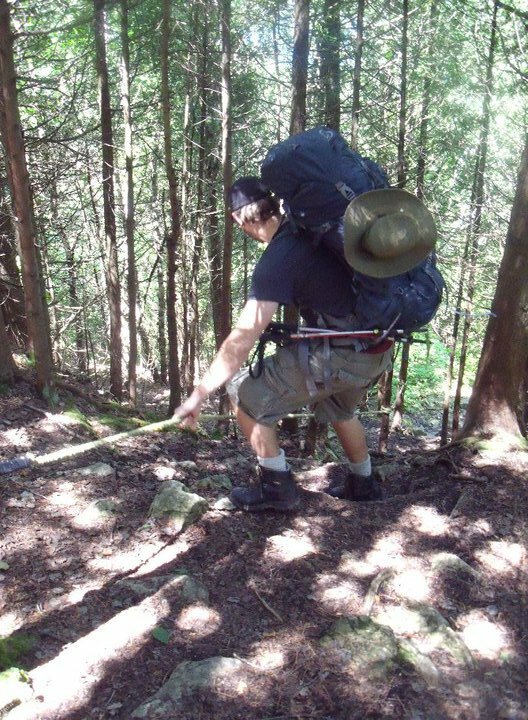 The trail to Stormhaven traces what is arguably the most technically demanding stretch of the Bruce Trail. Uneven rocks pocketed with eroded potholes make their way up and down innumerable bumps in the trail. It would be exhausting if you weren’t constantly forced to stop and take in the amazing views. The hike to Stormhaven is 10 km long and nearly the entire day is spent along cliff edges overlooking Georgian Bay from a height of several hundred feet. To make matters more exciting, the hiker is reminded that the cliffs are often overhanging with the presence of holes in the trail that offer glimpses straight down to the lakeshore directly below. When we finally made it to Stormhaven our party was spent. The up and down nature of the trail combined with the final sections over loose stones took their toll on our energy reserves. We spent the night lounging and eating dinner at a dining room set made of the large flat stones that litter the beach at Stormhaven. We enjoyed the sunset and views out to Bear’s Rump Island before retiring to our tent to recover. The final day of our hiking adventure was bitter-sweet. It is always hard to leave a place as beautiful as Bruce Peninsula National Park. It is even harder when the final stretch of hiking is in excess of 20 kilometers long. Fortunately for us, the crown jewel of our hike lay in the first few kilometers of Day 3 and was accessible to the wider world. 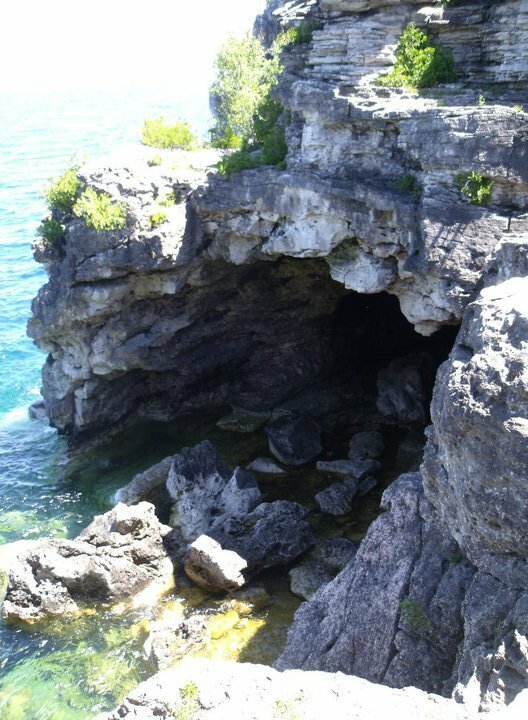 At a point just beyond Cypress Lake where its waters drain into the larger Lake Huron, a natural feature called The Grotto offers an accessible natural wonder to anyone willing to make the trip. The Grotto is a large amphitheater-shaped cave in the cliff face of the escarpment. It affords a calm water respite from the crashing waves of Georgian Bay and, for the more adventurous, an underwater tunnel where brave swimmers can hold their breath and swim beneath the cave wall before popping up on the outside. The three of us did little more than dip a toe in the water as the early July day did not lend itself to a plunge in the Bay’s frigid waters. Having seen what we came to see and having slept where we had hoped to sleep, the trip was all but over. We were faced with the decision to either hike the remaining distance to Tobermory or to make friends along the trail up to Cypress Lake and request a lift to our car. We opted for the latter and along the way to Cyrpess Lake were treated to a sighting of an elusive massasauga rattlesnake before landing a ride with a friendly group of fellow hikers back to our car. All in all, the experience was worth every step and every bead of sweat. 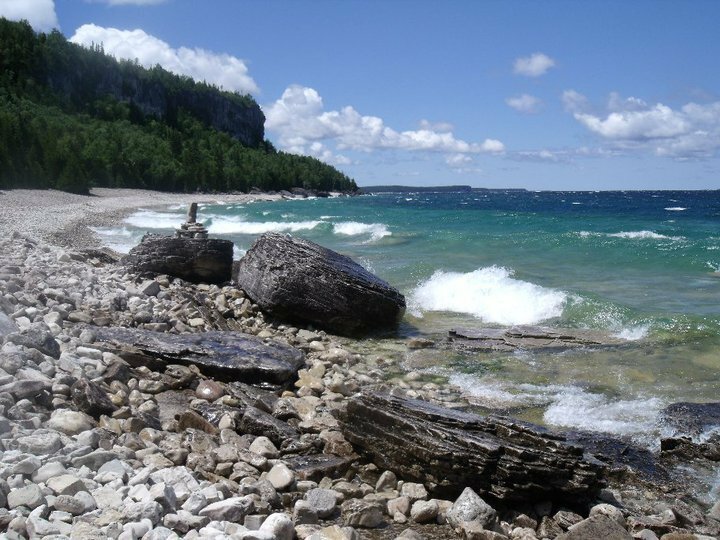 The trail through Bruce Peninsula National Park, in spite of its logistical challenges, offers an excellent introduction to backpacking for newcomers to the woods as well as fantastic scenery for experiences trekkers wanting to spend a relatively easy long weekend in a beautiful place. It is a trip well worth making. Hello Steve!! My best friend and I are thinking about doing this exact trip. I would love to get a little more info or maybe some tips you may have to make out hike one to remember. Great article BTW !! I’ve read it 4 times now and it really is getting me hyped!!!! Thanks for your advice! I’ve also read this post a couple times now. My husband and I are heading out there this weekend, but will be doing the loop from Cyprus Lake to High Dump then back to Cyprus Lake. It’ll be a challenging but fun. Can’t wait! Sorry! I only got the notification today that you had responded to my comment. I hope your hike went well. We didn’t find it horrible. It was the trying to squeeze it all into a short trip that really did us in. It was tiring, but we still came out alive and wanting to do more! 🙂 Next time, we’ll definitely opt to start at Halfway Log instead of Cyprus Lake. It is a rocky 10 km with a lot of places to stop and check the view. I believe we did it in about 5 hours making frequent stops for photos and such. I’m sure you could do it in 3 with a light pack and no stopping, but that isn’t what I would recommend. Take your time and enjoy it. Budget 5-7 hours. Thanks so much Steve! I would definitely like to take my time for breaks and photos! Hi! Great post! Just wondering how long your hike from Stormhaven to the Grotto? Are there any public transportation options from the Grotto parking lot back to Crane Lake Parking lot? Thanks!! Hi Olivia, admittedly it has been several years since I did this trip but I recall the hike from Stromhaven to the Grotto being at least a couple hours. We were carrying large packs the hike was mostly on rock covered beaches, so it was fairly challenging at times. I can’t say what has changed since I was last there, but in my experience there is no parking lot for the Grotto. Cars have to be left at Crane Lake and you have to hike the easy 30 minutes out to the grotto. You can park at Cyprus Lake and walk to the grotto (I think that’s what Steve meant instead of Crane). Crane Lake is much further away and I don’t believe there is public transit but perhaps a taxi or shuttle? Hopefully this link works to the map of the park with distances between locations on the trails: 2.7km of trail hiking (or maybe beach) between Grotto and Stormhaven but I have not done this section.